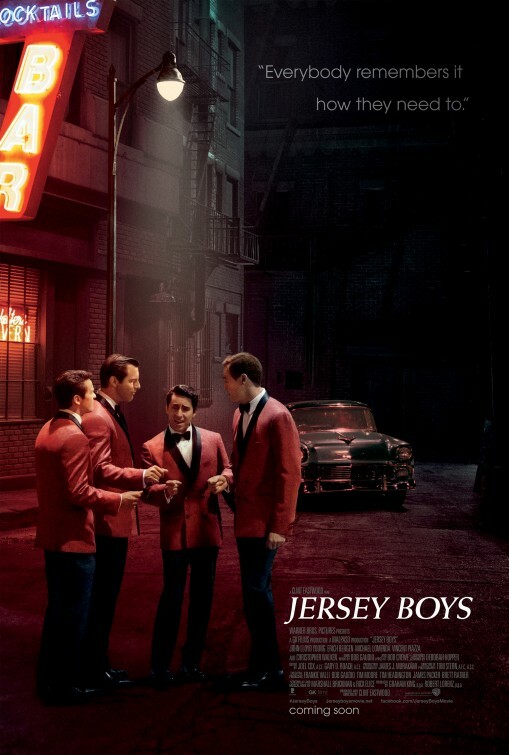 Review: When it was first announced that the Tony Award winning smash hit Broadway show Jersey Boys would be making the transition from stage musical to movie musical, it seemed like a fairly logical move. The show was still driving audiences crazy on Broadway, on tour, in Vegas, Canada, London, and other international locations and was fueled by genuine nostalgia and a highly cinematic staging that made you feel like you were living the show right along with the stars onstage. Though it briefly fell into the directorial lap of Jon Favreau (Iron Man, Iron Man 2), when he eventually backed out suddenly Oscar winning director Clint Eastwood set his sights on the property and soon The Man with No Name was lensing the adaptation in his typical economical style. I actually thought Eastwood was a good and not so obvious choice to helm the picture, an actor’s director that could help find balance between the trappings of a stage-bound musical structure and the free-range fantasy film can afford. This was a flashy show that seemed pre-packaged to make a very entertaining film. Honestly, I was pretty shell shocked just five minutes into the film because I could see some of the trepidation that has been steadily growing as the film neared release was coming true. In the weeks leading up to the screening, I couldn’t believe that Warner Brothers assembled such an average looking trailer and was failing to promote the film that had a pretty decent pedigree behind it. Why would they dump the film smack dab in the middle of summer when everything about the film version of Jersey Boys felt like a late fall release? Well…like their utter failure two years ago with Rock of Ages, Warner Brothers knew they had a total turkey on their hands and wanted it to go away as fast as possible. However, what Rock of Ages had that Jersey Boys doesn’t were name stars filling out the various roles and not the newcomers that Eastwood has assembled. With many cast members (and three of the title men) culled from various productions of the show worldwide, the cast more than acquits themselves with the music (more on that in a moment) but their green-ness shows when the music stops and actual acting is required. We have to start with the music. I’m hoping that an extended cut of Jersey Boys is released on BluRay…and that this alternate version will have, oh, I don’ t know MUSIC in it. Eastwood has taken a big bona fide smash Broadway musical and turned it into a biopic drama with musical moments. Now, I’m not saying he had to just film what was onstage…but he had free range to go big and instead he strips the music out almost entirely and instead focuses on the men themselves. Understanding that in any adaptation certain concessions have to be made, what exists in Eastwood’s Jersey Boys is not even a mild representation of what audiences lose their minds for nightly at productions around the world. Screenwriters Marshall Brickman and Rick Elice adapted their own musical script, sadly dropping many of the magical moments and retaining all the problems…like the ill-advised direct to camera address that lands like a thud. This is partly because it’s not used with the consistently or the panache of its Broadway counterpart and also because it remains a cheap narrative trick slyly designed to help keep a fast moving show zipping along. Eastwood lets absolutely all of the air out of the film pretty much from the get go…including removing any underscore. Without music, we’re left to really get a listen to the hokey dialogue and comically bad accents. All the men are basically giving their take on Robert DeNiro and all women are trying to out Marisa Tomei each other. Example: “Yo ah soch ah lu-sah” Translation: “You are such a loser.” Time flies by and occasionally a character will interject what year it is or a title card will help audiences get their bearings…until the film mystically starts going backwards in time. You’ll need a roadmap to keep track of it all…but you probably won’t care. I’ve seen the stage show twice and only really liked it the second time around when I stood back and saw it for what it was: a high class jukebox musical that was rough around the edges like the men at the center of the story they were trying to tell. Most of the music sprung from performance, not from the gut of a hackneyed emotional outburst. There were moments of true magic as all the pieces fit into place and the The Four Seasons unleashed songs like Sherry, Big Girls, Walk Like a Man, Dawn, Rag Doll…it was thrilling. Most of these winning set-ups still exist in the film version but have arrived without any verve or showmanship…making it all one big heaping bore. All of this may have been more tolerable had Eastwood went against his gut instinct and cast his film a different way. I appreciate he wanted to go with stage actors who could sing the music live and already had a working knowledge of the material but though they are in step on the familiar Four Seasons choreography, not a one of them seems to be on the same page with each other. John Lloyd Young won a Tony Award for playing Frankie Valli onstage but the awards will stop there based on his dreadfully desperate attempt at dramatic range here. I went back after the film and watched some of Valli’s performances from back in the day and nowhere did I see Valli make the kind of pained faces Young does as he strains to hit Valli’s effortless high notes. Further stymied by a wig from the Scott Baio line of near-mullets, Young’s overly emotive squinty singing style comes across like he’s wearing 20 pairs of too small underoos with a bright light constantly being shined directly into his face. With their supposed lead letting them down in a big way, the remaining Seasons aren’t nearly as bad but have their own dull hang-ups that keep them from working out in the end. Erich Bergen’s habit of looking into the camera with a knowing gaze made me feel like he was auditioning for The Office, not playing the golden boy songwriter that gave Valli his greatest hits, Michael Lomenda looks like Goofy and sounds like him often too as the dopey bassist. Vincent Piazza is the only one of the four not previously involved with the production…but too often he comes across like he’s playing a deleted scene cut out of Goodfellas. Christopher Walken (The Dead Zone) is the biggest name you’ll see onscreen and while Brickman and Elice have significantly expanded his small time mobster role there are times when Walken is literally standing around with nothing to do on screen. Twenty (thirty?) years ago I could easily see Walken taking on the tough guy role played by Piazza but here he becomes another casualty of Eastwood’s lackadaisical approach. When the film flashes forward to the early 90s you’d be advised to hold on to your hat because you’re going to see some jaw-droppingly bad make-up on display. I’ve seen better old-age make-up on a grade school production of Driving Miss Daisy. It’s the embarrassing capper on an embarrassing experience. But wait…Eastwood saves the best/worst for last by truncating the penultimate showstopper of a finale in favor of a drab mega mix and fully realized production number that is both totally random and wildly inappropriate. And the final shots of the film must be designed to play over applause…but our audience sat in stunned silence. It’s truly one for the head slapper record books. The one thing the film has going for it (and trust me, it’s one thing only) is that the design team has crafted an impeccable looking film. Production designer James J. Murakami gets every precise detail down pat and Deborah Hopper’s costumes are period perfect…not that they don’t feature some truly awful fashion trends most would rather forget completely. Were you to watch the film on mute (and without hardly any music…you usually are) you’d see how richly designed the film is. Earning points for being well sung and immaculately designed, there’s little else to recommend about Eastwood’s tuneless (literally) attempt at bringing the Jersey Boys to the big screen. Now little more than your run of the mill entertainment biopic, audiences are strongly advised to wait until the show comes through your town and seeing the story as it really deserves to be told.